Since there were multiple beautiful mashed potatoes, Thanksgiving posts, I didn't feel compelled to add yet another. Simply wanted to tell you about my mashed potatoes chronicles, as I dreaded making my version for an American crowd, much less this past Thanksgiving weekend, a European one. Though I am always determined and make it my mission to win over even the most skeptical audience with my olive oil creamed potatoes. Sagie came home with three buddies of his from college. One adventurous Midlands Brit, another, Sagie's roommate, a Manchester Brit, just in the middle there, and a third, a Glasgow Scot*, extremely fussy in addition to a severe gluten allergy. Might have developed the fussiness due to intolerance but we will never know. All three, adorable. I am as usual outnumbered! Fussy or not, we are speaking mashed potatoes here, and I stripped these fat ladden staple and thinned them out with olive oil. The blasphemy! Gasp! I felt insecure, it's cyclical, but protective of my mashed loved ones. At the table, I avoid direct eye contact, just an occasional glance, wonder if they would pass and get a seal of approval?! This time I tempted my luck further and added celeriac into the boiling sorcerer's?! potatoes pot, not to mention my usual 2-4 whole garlic cloves, still wrapped in their skin turning into smooth mild paste in their coats. Dancing in the sputtering torrid waters knocked left and right by celery root and potatoes. Then to add insult to injury sauteed some sliced leeks and added to the mashed mix. The adventurous one, the one just right there in the middle and the third fussy one, thought it was just splendid, and helped themselves to seconds and had them celeriac mashed potatoes for leftovers. They said it was just like Christmas dinner back home, and I felt relieved, thankful and most of all, in all truthfulness, victorious! The potato, a starchy edible tuber originated in Peru and domesticated there between 8000BC - 5000BC. I have discussed the origin and domestication and spread of the potatoes worldwide in Smashed Majestic Purple Potatoes post. You can further read about this fascinating spud dominating our diets here. The celeriac, pictured at the top, was the added twist that made this dish. A root vegetable low in starch unlike other root vegetables. I find it has a milder celery flavor and it is not difficult to work with as you might suspect. In Israel we have it often peeled, sliced raw with some lemon, olive oil and salt and sometimes some paprika sprinkle. 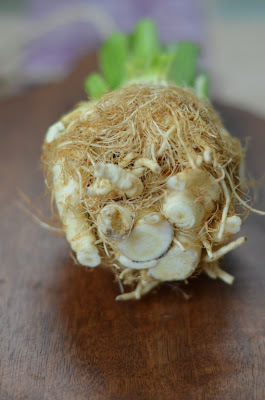 You can read more about celery root here. *Technically all three are British. Love the recap! Thanks for sharing this recipe, Shulie! Ah success! So glad they liked them. There's always that moment of anticipation as they first taste it isn't there? I just posted a recipe for potato and celery root soup on my soup blog -- it's a wonderful combination, isn't it? That is something I love to eat! Thanks for sharing. A comfort food for me...and glad that all the buddies enjoyed it! What a fun delicious sounding digression from the standard, often boring, mashed potatoes! I will try this soon! What a delicious, ultimate comfort food, Shulie! I have a bag of potatoes from last week. I just might do this. Thanks for sharing. I am blessed with good foodie friends like you & I am grateful! I feel like this every time I try a new recipe when I have guests over! Loved reading your post. Oh great recap and I love love celeriac!!! Great roasted, yum! Success :D I'm so glad they liked them, I loooove celeriac as well! I made a celeriac and potato gratin earlier this year - a much under-used vegetable in the US - I was introduced by a British friend. Great idea for the mash. Thx Bri. So simple yet packed w/flavor. Thx Sylvie, yep, exactly, moment of anticipation! :)Thx Lydia, I will head over to look for your soup. Indeed a winning combination. Thx Rosa, seems an underused vegetable in US but I hear Europeans use it more? Thx Sanjeeta, completely comforting! :) @cafesucre next time I make it I will keep your words in mind so I won't be as nervous serving my version:). Thx. Thx Betty Ann. Aww Chinmayie, Thank you. happy you enjoyed reading it. It was a bout the writing this time but dish is simple and delicious. Roasted Celeriac Nellie, never tried it. I will & report back. Thx Maria. Thx Yuri. I know right?! I need to pick your brain about ideas for it. TY Katie, I completely agree. I think people are intimidated prepping it. Don't realize it is simpler than it looks. Grain sounds good. i have never tried celeriac before, but am a bit more open to trying it now! :) i want to try roasting it, as per nelly! I have never had celeriac and sounds from your recipe, i am missing out a lot. you don't make eye contact.. LOL Shulie.. Love the photographs. I see it in store all the time and I want to become a celeriac fan. This post, however, led me to purple smashed potatoes, because I have some in my pantry and can't wait to try. BTW, congrats on the Nikon DSLR purchase. I love mine :) What model did you get? Lovely recipe. Gotta try it soon. Bookmarked. Thx Lora such humble root but definitely adds a dimension. Junia, yes def. me too would like to roast it next time, as curious as you. Soma, ahahahha yep me being sheepish sometimes. Just the anticipation. lol & thx. Angela me too which reminds me I got to make them, Purple potatoes don't last as long as regular ones. Thx for dropping by. Thx Priscilla. Yep I take much pleasure in winning over kids. Thx for your kind words. Kiran, you should. Let me know when you do. & I got a Nikon 5100 w/a std lens and a 1.4/50mm one too. Thank you Fifi:). Sarah ahahaha big compliment TY! What an educational post on potatoes. So helpful to know. I love the idea of olive oil in potatoes...good flavor & good health tip! Thanks for sharing, Shulie! Happy Holidays!